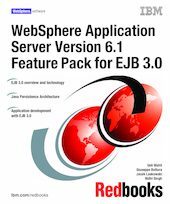 This IBM® Redbooks® publication introduces the Enterprise JavaBeans™ (EJB™) 3.0 technology and describes its implementation in IBM WebSphere products through the Feature Pack for EJB 3.0. This book will help you install, tailor, and configure WebSphere Application Server Version 6.1 with the Feature Pack for EJB 3.0. It is written for application developers, who want to use EJB 3.0 in an IBM WebSphere environment, and for WebSphere administrators, who have to configure WebSphere Application Server V6.1 with EJB 3.0 in distributed environments and on the z/OS® platform. - Part 1 covers the specifications for EJB 3.0 and Java Persistence Architecture (JPA), and the installation of the Feature Pack for EJB 3.0. - Part 2 covers application development using EJB 3.0, including JPA entities, EJB session beans, message-driven beans, and a variety of EJB clients. - Part 3 covers the implementation of EJB 3.0 on the z/OS platform.